With their unusual name and trend-bucking sound, The Monochrome Cherubs caught me by surprise. 'Blisterene' defies the current hard rock trends of current American music with aggressive yet melodic riffs coupled with natural progressive nods, subversive psychedelic tendencies, and clever vocal arrangements. The Monochrome Cherubs are neither youngsters nor novices to the rock n roll biz. Organizer, guitarist and vocalist Tim Lacy runs his own studio, The Mambo Room, in New York state, and has worked with Savatage, Badlands, INXS, and Radiohead among others. Drummer Mike Sciottos has seen time with Jefferson Starship and Sun Red Sun. Bassist Colin Almquist has been with TMC since the beginning and has played with Jake, Lynch, and more. Guitarist Nick Moroch credits include time with David Sanborn and David Bowie. Obviously, this is not ordinary crew and their collaboration demonstrates both musical skill and creativity. 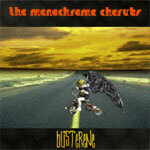 The Monochrome Cherubs music is, at times, as volatile as it is imaginative. Big riffs lead to even bigger melodies and catchy choruses with some innovative and unexpected fret work. The title track 'Blisterene' displays this tendency with Moroch's solo being the best of unconventional. 'Rip Off' and 'Shakedown' bring some heavier riffs and so delivers some serious guitar rock. This motif continues on my favorite, 'Don't Blame Me,' where the rhythm section steals the show before Lacy delivers a ripping guitar solo. For some real trippin' and wonderful guitar work listen to the end of 'New Day Burning:' excellent stuff (as is the whole song). Before you think I exceed my own expectations, I did find a dull moment in 'The Money Shot,' but not enough to ruin the superb continuity of this work. Throughout, 'Blisterene' delivers a host of unsuspecting and delightful surprises. Nothing like this being done stateside or otherwise. Unfortunately, as good and innovative as it is, I'm afraid TMC's 'Blisterene' will probably not catch on here in America. Let's hope our (more thoughtful) European friends will pick up on this. Very recommended! Throughout, 'Blisterene' delivers a host of unsuspecting and delightful surprises. Nothing like this being done stateside or otherwise. 'Blisterene' defies the current hard rock trends of current American music with aggressive yet melodic riffs coupled with natural progressive nods, subversive psychedelic tendencies, and clever vocal arrangements.